Enhancing your appearance with a tummy tuck! 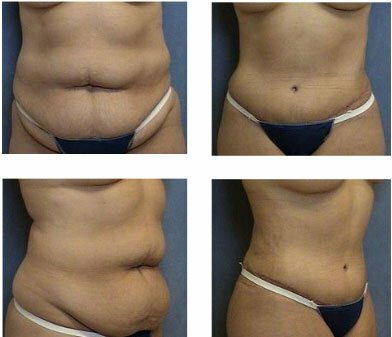 Also known as abdominoplasty, a tummy tuck removes excess of skin, and in most cases restores weakened or separated muscles creating an abdominal profile that is smoother and firmer. stretched out or lax over time. · To remove the effects of pregnancy on the abdomen. · To removes stretch marks or scars that may be in the area. · To removes the excess skin. · To have a top model tummy. · To solve preexisting problems, such as hernias or eventrations. An incision will be made from one hipbone to the other in the area above the pubic region and another one to allow the navel to detach from the surrounding tissue, but the incision size will depend on how much skin needs to be removed. The skin is separated from the abdominal wall and the abdominal muscles are tightened by pulling them closer together and stitching them into that pulled position. By tightening the abdominal muscles it can narrow the waistline even more by resulting in a firmer abdominal wall. The muscles are exposed when the surgeons make a skin flap that is later stretched down with the extra skin removed. Since the location of your belly button is moved during a tummy tuck surgery, a new hole is cut to re-stitch the belly button into place. A scar will result from the tummy tuck that extends across the lower part of the abdomen and in some cases around the belly button. You will have to rest at the hotel for 7 to 10 days. If you are in top physical condition, recovery will be much faster. Try to start walking as soon as possible. Sexual activity should be avoided for a minimum of two weeks. The inflammation is moderate and will remain for some days. Surgeon will remove the stitches between 10 to 12 days after the surgery. It is not usual for bruises to develop. The resulting scar runs from hip to hip, following the outline of a bikini. The abdominal scars will appear to worsen during the first three to six months, and may take nine months before they flatten and lighten in color. The scars never completely disappear, but they are located to be easily hidden by clothing. Patients dislike their scars for a number of reasons. Our medical team will make every effort to make your scars as inconspicuous as possible. Still, it's important to remember that tummy tuck scars are permanent. Fortunately, the scars can usually be placed so that you can wear even low-cut tops. A tummy tuck doesn't remove fat excess. It is not used for removing fat deposits when they are small and the skin has a good elasticity. If this is your case, and diets and physical exercise do not produce the desired results, liposculpture is the right thing for you. At Makeover Travel, we specialize in tummy tuck surgery. Because we do so many tummy tucks, we have come to clearly understand the results people are looking for from the procedure. One thing we hear time and again from our prospective tummy tuck patients is that they want a nice looking belly button. During a tummy tuck or abdominoplasty procedure, the belly button is detached from its surrounding skin and placed in a new position on the abdomen. While it does remain loosely attached to the deeper tissues inside, in many ways the belly button must be re-made during a tummy tuck because it is placed into a new area of surrounding skin. Our plastic surgeons provide a specialized technique to provide a pleasing appearance to the new belly button. Since the standard re-creation of a belly button was often "floating" in the belly, it did not have a natural appearance. The belly button had lost its attachments to surrounding skin and so the natural slope of the abdominal skin down toward the belly button was lost. Our surgeons technique was developed to address these issues. It creates a stronger "hood" at the top by stitching this part of the belly button loosely to the deep tissues of the abdominal wall. This positioning provides a solid platform for piercing, and also throws a darker shadow within the hole of the belly button, creating a more natural appearance. The bottom of the belly button is stitched more tightly to the deeper tissues to provide contrast to the top and highlight these effects. Our goal is to create a belly button that you will want to show off with low-cut jeans or a short-length shirt. Affordable plastic surgery packages abroad and Benefits of Plastic Surgery.